Having been a server for many years at a range of restaurants through my twenties, I learned all about the serving AND cooking part of the industry. I worked at a kaleidoscope of restaurants ranging from American, fine Italian dining and classic barbecue. It was all of those places that made me fall in love with beef brisket. This super moist, tender, and flavorful cut of beef is also one of the leanest available. What is there not to love? Although I had seen this beautiful cut of beef prepared multiple times, I had never dared to re-create this wonderfulness at home. Why? Well... because as Todd says, "Meat is HIS thing." Although I really love to cook anything... he takes sincere pride in all things meaty. So... I let him have it and the end result was WONDERFUL! Make sure to have enough time. I don't recommend trying to speed up the cooking process as the slower it cooks, the better the more tender the meat is. On that not, read below and give it a shot some Saturday or Sunday afternoon and then come tell me all your thoughts about it! A good close up of the fresh ingredients he started with. On a cutting board, mash the garlic and 1/2 teaspoon of the salt, garlic powder, and onion powder together with the flat-side of a knife into a paste. Add the Herbes de Provence seasoning and continue to mash until incorporated. 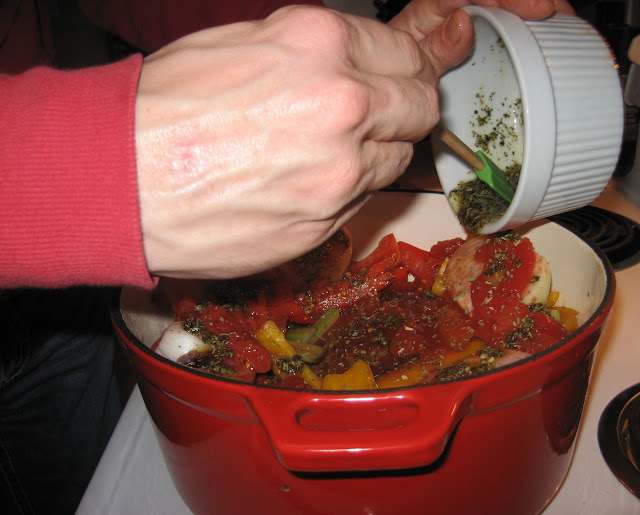 Put the garlic-seasoning paste in a small bowl and add 2 tablespoons of olive oil; stir to combine. Season both sides of the brisket with a fair amount of kosher salt and ground black pepper. 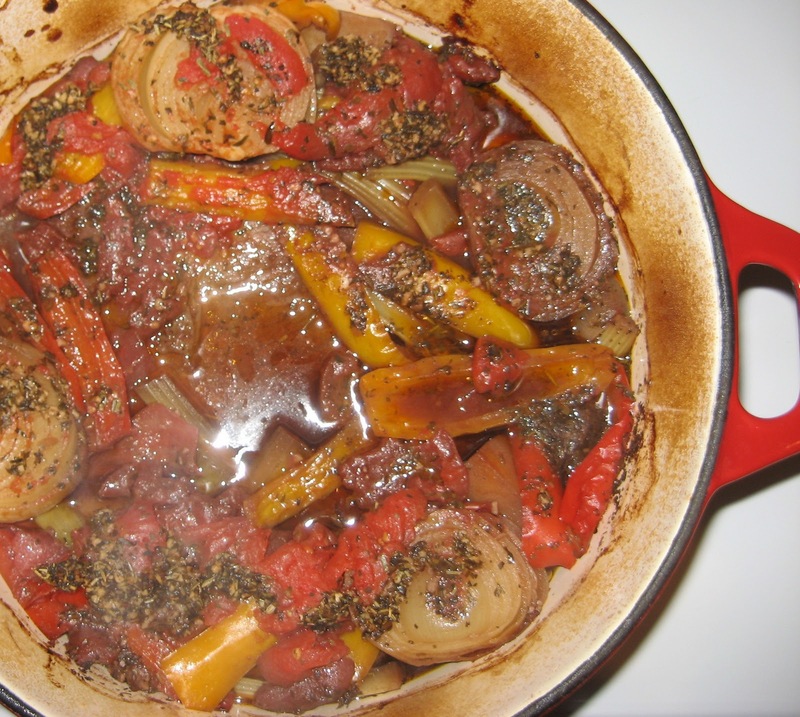 Place a large roasting pan or Dutch oven over medium-high flame and coat with the remaining olive oil. Put the brisket in the roasting pan and sear to form a nice brown crust on both sides. Lay the vegetables all around the brisket and pour the rosemary paste over the whole thing. Add the wine and tomatoes. Cover the pan tightly with cover and transfer to the oven. I even let him use the good wine. Bake for about 3 to 4 hours, basting every 30 minutes with the pan juices, until the beef is fork tender. Remove the brisket to a cutting board and let it rest for 15 minutes. 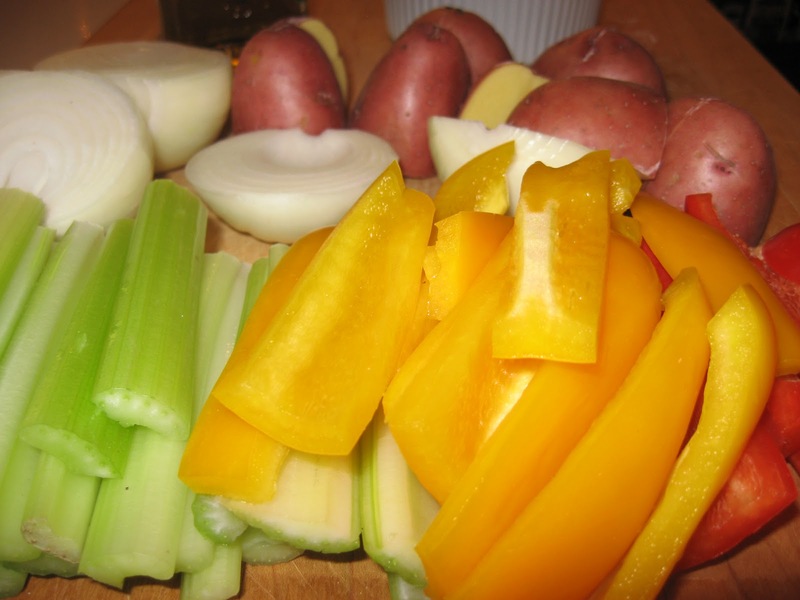 Scoop the vegetables out of the roasting pan and onto a platter, cover to keep warm. 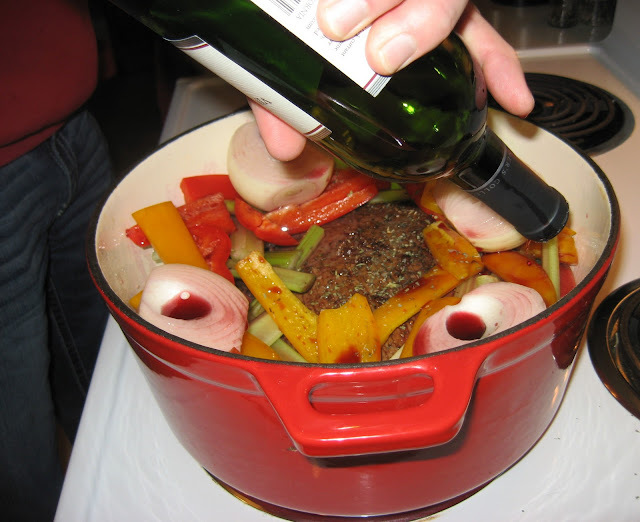 Pour out some of the excess fat, and put the roasting pan with the pan juices on the stove over medium-high heat. Boil and stir for 5 minutes until the sauce is reduced by 1/2. (If you want a thicker sauce, mix 1 tablespoon of flour with 2 tablespoons of wine or water and blend into the gravy). Look at that pan of roasted deliciousness!! Slice the brisket across the grain (the muscle lines) at a slight diagonal.